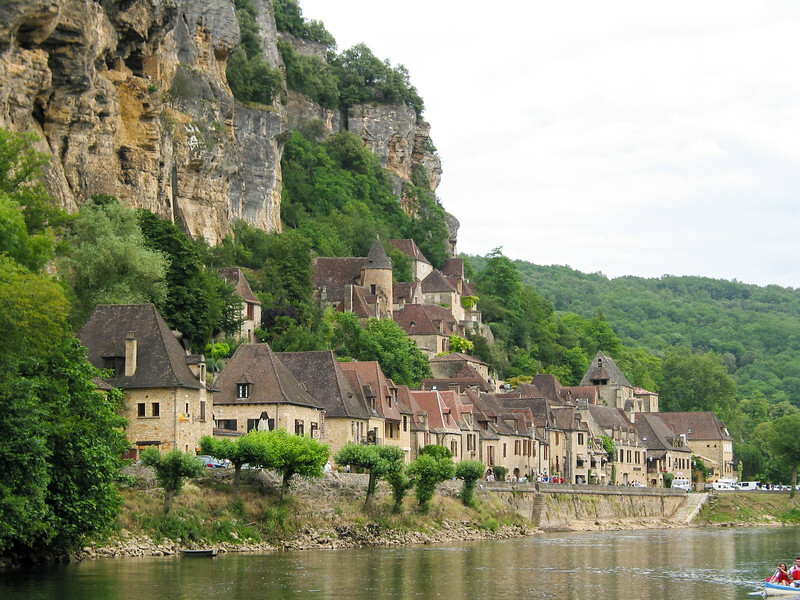 La Roque Gageac is a tiny village nestled under cliffs along the Dordogne. As recently as 1958, part of the cliff cracked off after an unusual freeze, and crushed a few houses and some inhabitants. Luckily it was a Sunday morning, and most were at church (or in the tavern!). There are troglodyte dwellings in the cliff face, and it's a good base for canoeing and boat trips. The kids and I took a tour boat down the Dordogne to the bridge before Castelnaud, and back. Because it's sheltered from the north winds, the village enjoys a beneficial micro-climate, which allows Mediterranean and even tropical plants such as lemon and banana trees to grow. The nearby Château de la Malartrie was actually only started late in the 19th century, completed in 1920, in a 15th-century Renaissance-revival style.